See Profiles for information about which user profiles can view or can change the account settings. To go to the Account settings page, click > Account settings. 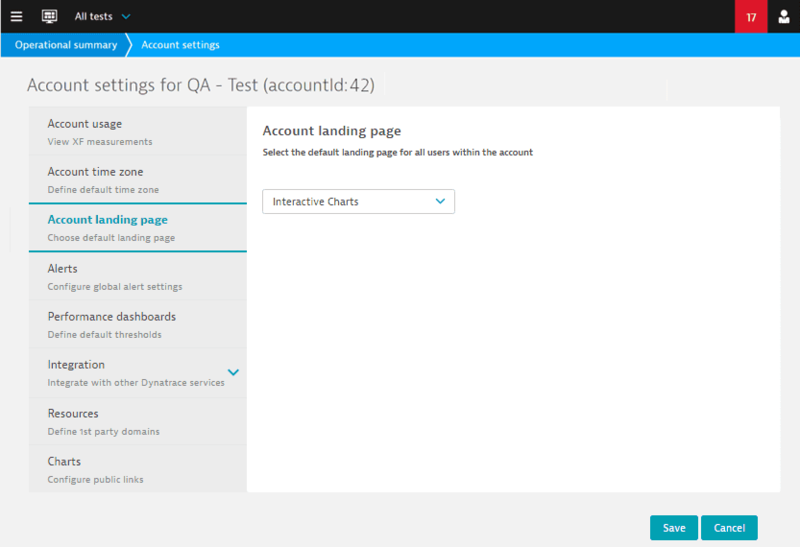 The Account settings page identifies your account and provides access to account information and settings. 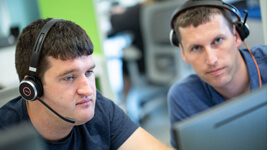 To identify your account when you request help from Customer Support, provide the Account name and Account ID displayed at the top of the Account settings page. 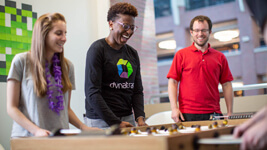 Plan – The term length of your contract, the start date, and the end date. Allowance – The number of XF measurements available for the month. Used – The number of XF measurements used by test runs during the month. Projection – An estimate of total usage for the month, calculated from the daily usage month-to-date. Overages – Projected overage, if any, based on the projection. Overages cost – Estimate of what you will be charged for XF usage beyond the contract amount. 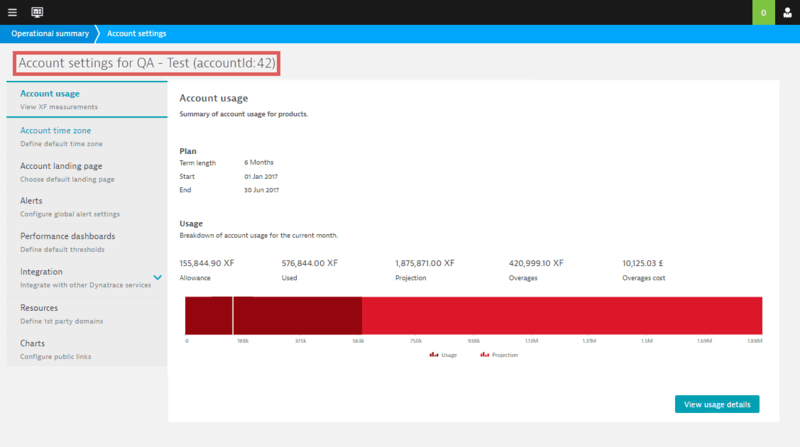 The overage cost is displayed in the currency specified when your account was created. 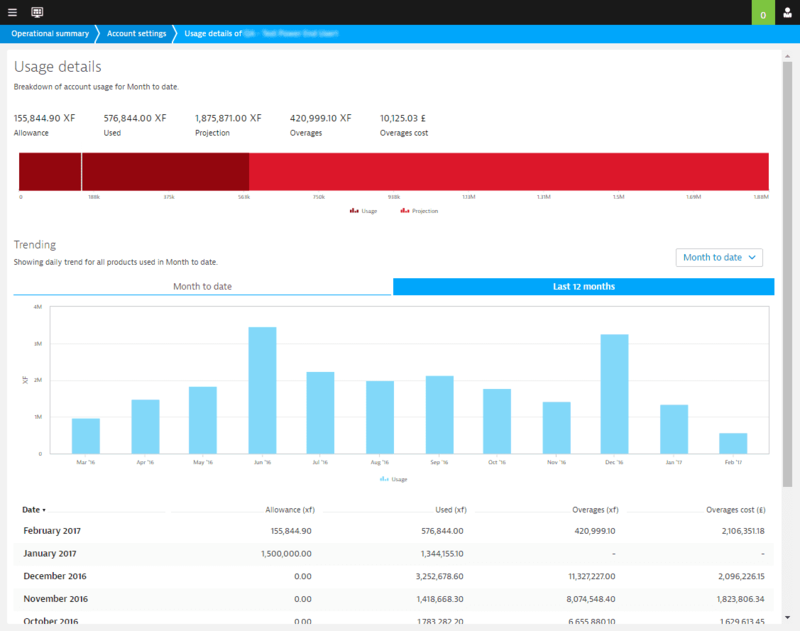 Actual vs. projected – The chart at the bottom of the tab shows you at a glance the projected usage for the month and the actual usage month-to-date. A vertical line indicates your monthly allowance, showing whether you&apos;ve exceeded that allowance. Click View usage details at the bottom of the page to display detailed information for the selected time period. The usage statistics and Actual vs. project chart for the current month. Bar charts that show usage for a selected month and the last 12 months. The default chart shows daily usage for the current Month to date. To see usage for one of the previous 12 months, select the month from the list at the top right corner of the page. Note that the list includes Last month instead of the name of the previous month, and Month to date to return to the default chart. When you select an item from this list, the tab title changes to identify the time period (e.g. Last month or the month/year). 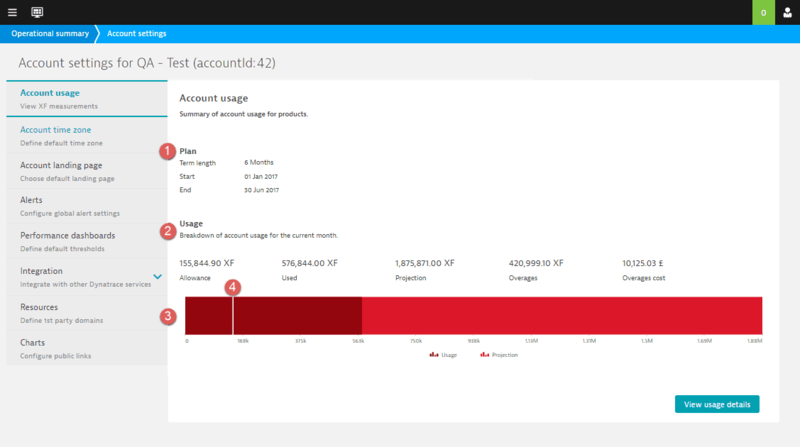 Red shading shows you if usage has exceeded the allowance. The daily usage bars are shaded to break out the usage by test type, as identified in the legend. Hover over a bar to see the actual XF measurements used by each test type on that day. The table below the chart lists, for each day, the usage by test type: Backbone, Private Last Mile, and Mobile. (Last Mile tests are not included in the usage statistics.) The last column lists the total usage for all tests. Select the Last 12 months tab to see a chart of each month&apos;s total usage beginning with 12 months ago: for example, in March 2017, the chart shows the total usage from April 1, 2016 through the current month to date. Hover over a bar to see the actual XF measurements usage in that month. XF measurements Used during the month. Overages, if usage exceeded the monthly allowance. Click the Date column header to sort the list in ascending or descending order. The Usage Summary Report also provides details of XF measurements usage for a selected month and the usage trend for the last 12 months. The report can be delivered by email on a daily, weekly, or monthly schedule. 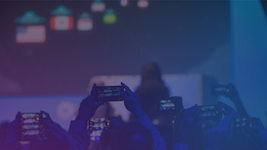 This setting defines the time zone used for charting (including the interactive charts and charts in a custom Dashboards page), alerting, reports, and the Event Log; and for timestamps such as Modified or Last Refresh, throughout the Synthetic Classic Portal. All time zones are relative to Greenwich Mean Time (GMT). For example, Eastern Time is GMT–5 and UK Daylight Saving Time is GMT+1. 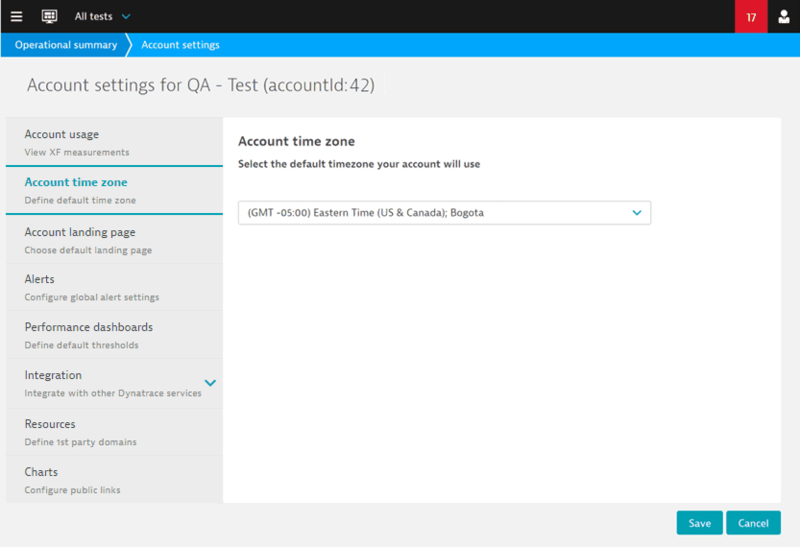 To configure the account time zone, select the time zone from the list. Note that the list includes Daylight Savings Time and Summer Time settings in case you need to adjust your account time zone&apos;s GMT offset. The time zone is applied account-wide, and cannot be adjusted for individual locations. Users in all locations will see times reported based on the account time zone. The one exception is in the custom dashboards: the Last modified time is the local time. This setting defines the page that appears automatically when users in your account log in to the Portal. If a default landing page is not selected for the account, the Operational summary is the default page. Users can select their own landing page through the My profile page. 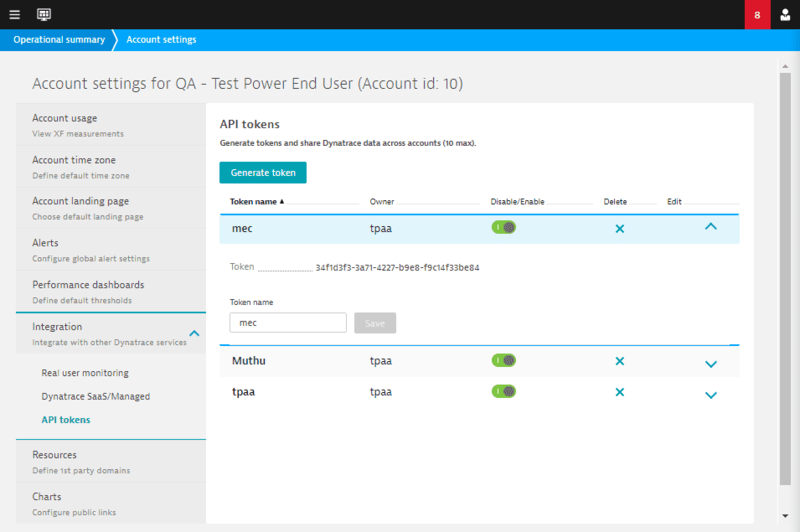 Use the Account-wide alerts control switch to enable or disable all alerts for your account without changing the settings for individual tests. To enable all alerts, set the switch on. To disable all alerts, set the switch off. 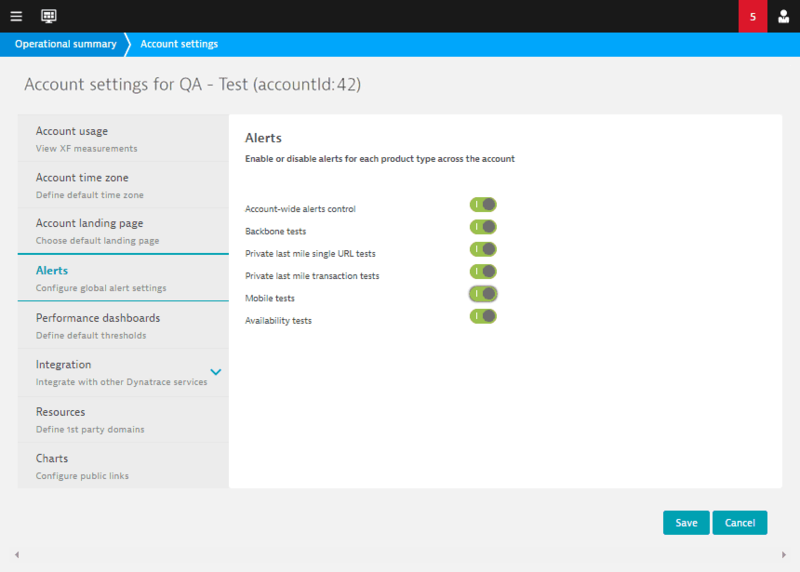 You can enable/disable alerts for each test type (product) when account-wide alerts are enabled. Select On to enable alerts or Off to disable them. 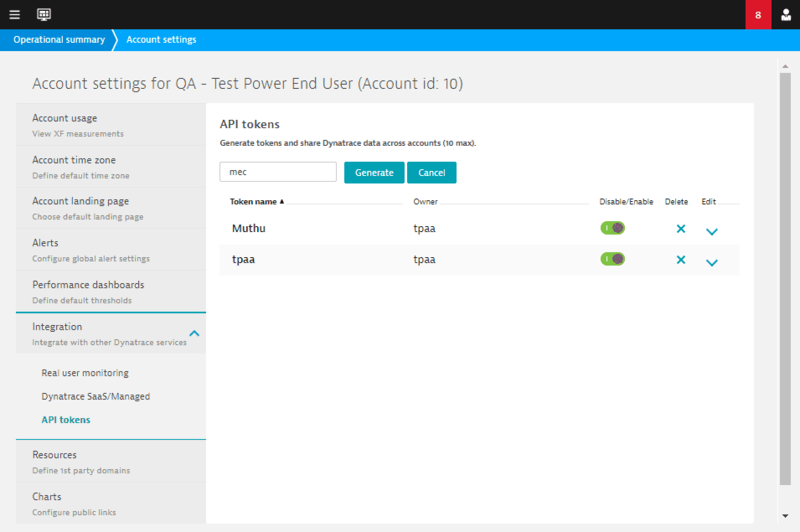 Depending on your user profile, you can also enable/disable alerts for all tests in your account through the Alerts page. 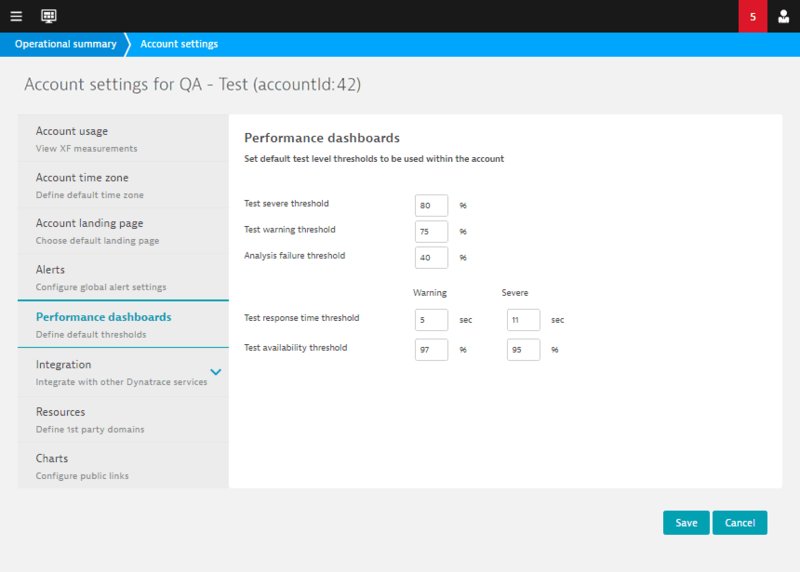 Use these settings to define the thresholds for the Performance dashboard. Test severe threshold – Used to determine the status of a test run. If the percentage of tests with a severe response time in a test run exceeds this percentage, the status of the test run is severe. Test warning threshold – Used to determine the status of a test run. If the percentage of tests with a warning response time in a test run exceeds this percentage, the status of the test run is warning. Specify the default warning and severe level thresholds for response time and availability for each test in a Performance dashboard. Test response time threshold – The warning and severe level thresholds, in seconds. Test availability threshold – The warning and severe level thresholds, in percentages. You can change thresholds for individual tests or all tests in a folder through the Thresholds configurator, accessed through the Operational summary page. 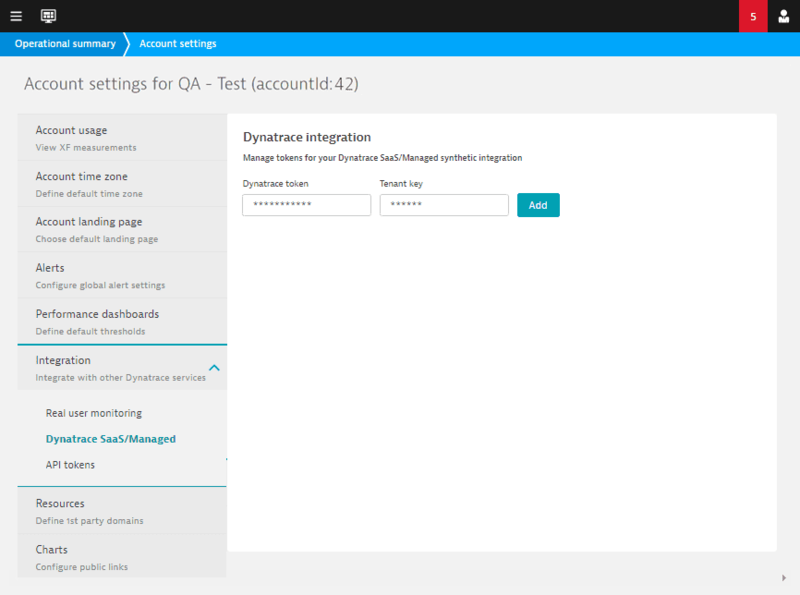 Use the settings in the Integration screens to configure integration with other Dynatrace services. 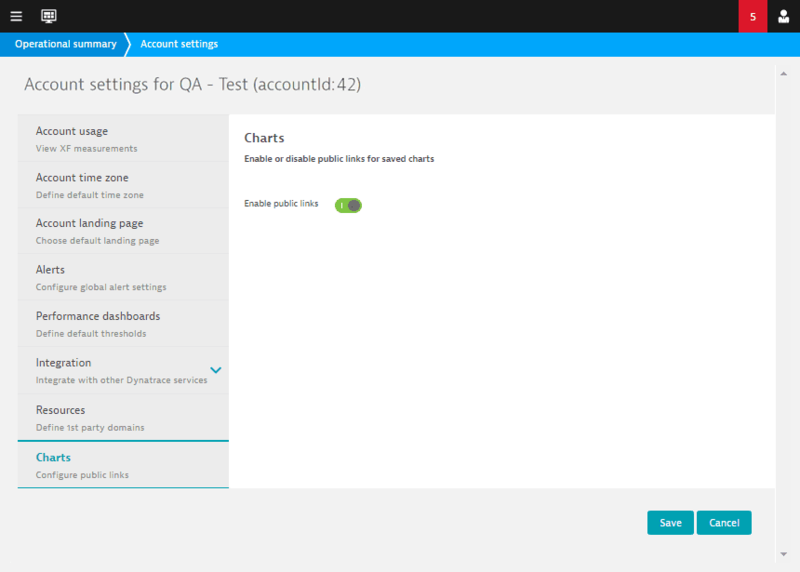 If Dynatrace AppMon integration is enabled for your account, configure these AppMon Server settings in order to drill down from the waterfall chart in the Synthetic Classic Portal to PurePaths in AppMon. 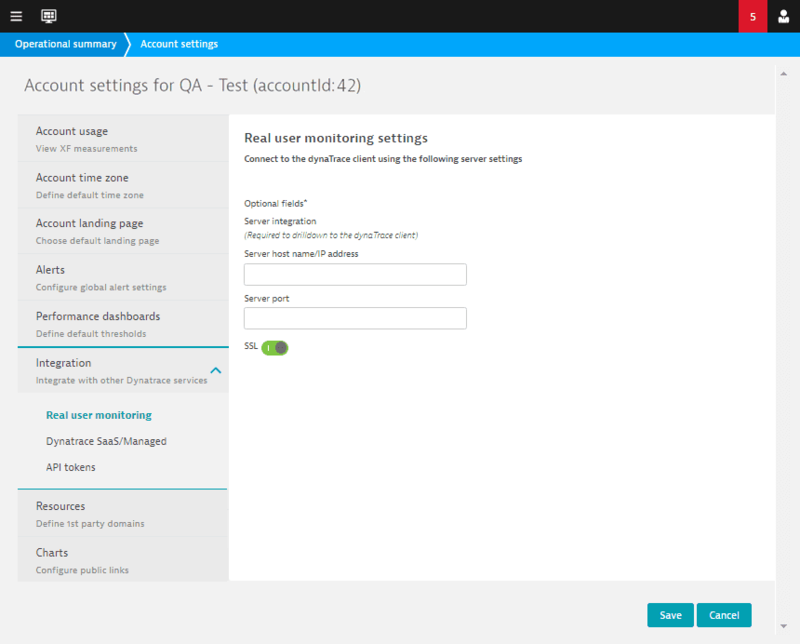 If Real user monitoring settings are not available, open a License Management support ticket and request that the integration with AppMon be enabled for your account. Server host name/IP address – The host or IP address for the AppMon Server. Server port – The port used by the AppMon Server. SSL – Enabled by default ; set the switch to off to disable SSL. 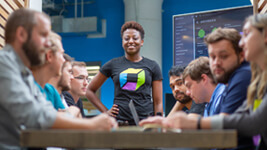 If integration with Dynatrace SaaS/Managed is enabled for your account, use these settings to specify the token and tenant key that connect Dynatrace SaaS/Managed with Synthetic Classic. 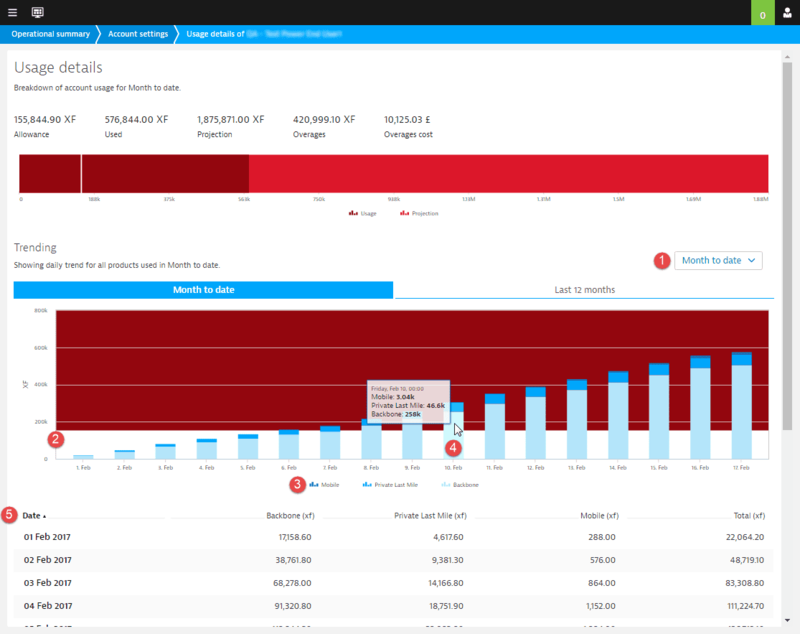 See Integration with Dynatrace SaaS/Managed for details. 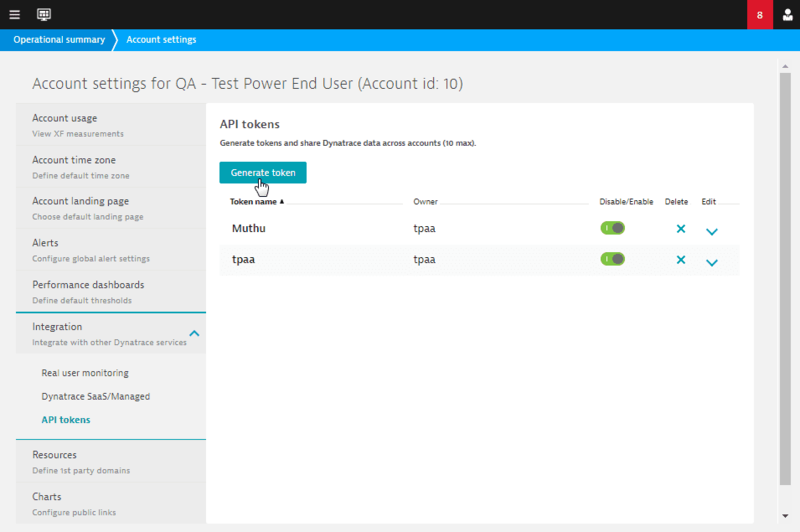 Generate API tokens for alternative authentication in the REST API, API Version 3.2, API Version 3.3, Test Management API 3.0, and Alert Management API 3.0. Select Integration > API tokens. In the API tokens screen, click Generate token. Type a name in the field. The name can contain any alphanumeric character, but must not contain spaces. Click Generate to add the token to the list. Click the expand icon in the Edit column to view the token details. By default, the newly created token is enabled. Click the switch to disable it . You can change the token name, but not the token&apos;s value. 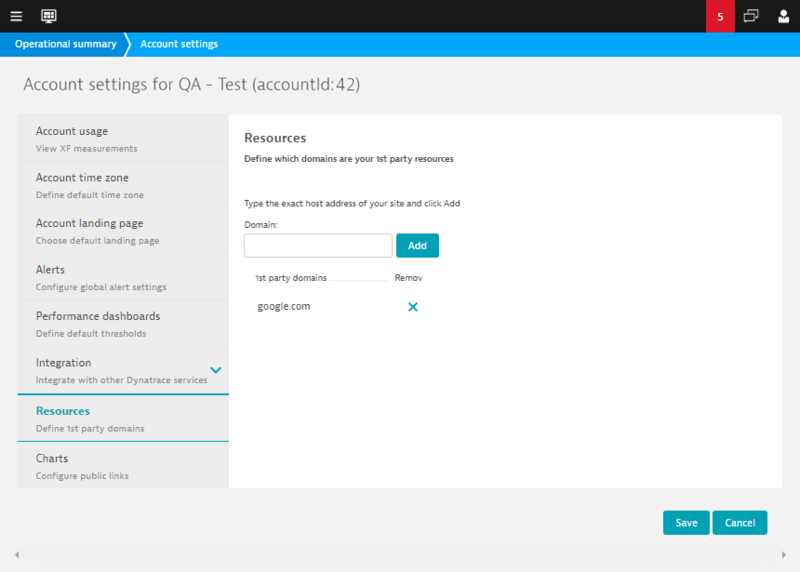 The Resources screen lists the hosts that are your first-party domains. 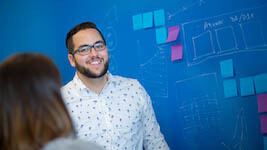 Identifying your first-party domains ensures that the first-party and third-party data in the Test overview page will be more accurate. To add a service, enter the Domain name in the field and click Add. You can use alpha-numeric characters, period ( . 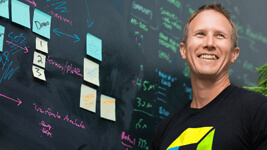 ), and dash ( - ). The period and dash cannot be the first or last character. To remove a service, click the remove icon in the table. Use this setting to enable or disable the ability to create public links of interactive charts, waterfall charts, or SCoE information. Select Yes to enable or No to disable. Temporary links will stay available until they expire. Permanent links will stay available until they are removed.